Win a FREE copy of Morah, Morah, Teach Me Torah – plus an author interview! THIS GIVEAWAY IS NOW CLOSED! The winner is Elissa/Elisa. Please contact me at Jay3fer “at” gmail “dot” com within 3 days (before Tuesday, July 10th) with your mailing information. In the event that I don’t hear from you within that time, I will draw another winner. Thanks!!! I bought Morah, Morah, Teach Me Torah just before Shavuos (literally, minutes before the bookstore closed) and have been enjoying it weekly ever since. I don’t look at it before I write my parsha overviews, but I do read it when I’m planning what sorts of things to do with my kids in connection with the parsha. It’s also something I can read with them if I choose. There are so many reasons I like this book! Despite the very cute picture on the cover, it’s not just for teeny-weeny kids. It features simple songs (if you know basic tunes to kids’ songs in English, like Mary Had a Little Lamb, or The Ants Come Marching, you can sing these songs! ), parsha summaries, activity ideas, Shabbos-table discussion topics, crafts and lots more. But why take my word for it…? I contacted one of the authors, Nechama Retting, and she has agreed to send a free copy to one reader, anywhere in the world. Plus, she was very, very nice about answering my nosy questions. So check out what she has to say about the book, and then enter the giveaway at the bottom of the page. Contest ends motzaei Shabbos, July 7th. There will be one winner, announced at the top of this post, on Monday, July 9th. I will contact the winner to get an address for shipping. Please allow several weeks for shipping directly from the author. And remember, you can still enter to win (and keep on tweeting if you’ve already entered) my other giveaway, for a set of Aleph-Bet Stix!!! JML: What is Morah, Morah, Teach Me Torah? What makes it special? JML: Who's using the book? NR: Baruch Hashem, we have heard from many people who love the book! There is even a Hillel that is using it as a basis for their Torah study with college students. We have also heard from parents who use it in homeschooling, teachers in Day schools, preschools, also Tot Shabbat leaders and Religious School teachers and even lay leaders who use it for their youth services! JML: For what ages and grades is it most appropriate? NR: It was written for Early Childhood (which encompasses ages 2-8) but we’ve heard from many others using it, too! JML: What's your own Jewish background? NR: Tobey and I both teach in a Conservative Congregational School. I also teach in an Orthodox Religious School. Tobey comes from a traditional Conservative background and reads Torah regularly at the Conservative shul where we teach. I am the product of a mixed marriage, and didn't really begin my Jewish journey until I was a young adult. I have become more observant over the years and now define myself as “Conservadox.” Since there is no Modern Orthodox shul in my Community, I go back and forth between the Conservative shul and Chabad which are both walking distance from my house. JML: Tell me a little about your own family. NR: Tobey is married and has 2 grown children. I am also married and have 5 children ranging in age from 10-24. JML: For how long have you been teaching? What's your favourite age to teach? NR: Tobey has been teaching for over 25 years and LOVES teaching Pre-K children. I have been teaching for 18 years and have enjoyed teaching children between the ages of 3-8. I currently teach a 3-4's class, a 2nd grade Hebrew school class, and a multi-age Hebrew school class – all of which I am really enjoying! JML: How did you two come up with the idea of releasing this parsha curriculum as a book? NR: Tobey and I lead a Kaballat Shabbat program at our school and found it challenging to find child-centered information about the weekly parasha, so we started writing our own. I had always wanted to write a “Parasha with a Project” kind of book, so as we started compiling we realized we had a pretty cool thing that we should try and share with others! JML: How long did it take you to put this book together? NR: I'm not sure how long it took to put it together, since we sort of wrote it as we went along (so at least a year), and then we compiled it and edited during one summer. JML: Was it easy to find a publisher for the book? NR: Finding a publisher was not so hard since there are not a lot of Jewish publishers out there! We were very blessed that Torah Aura Publications wanted to publish it! JML: What's the best part about the book, in your opinion? JML: What was the hardest part to write? And how do you teach parsha in situations where there isn't a straightforward “storyline”? NR: I think the hardest parts to write were the parshiot in Vayikra, because there is a lot of rule repetition so we really had to challenge ourselves to come up with different multi-media ideas to engage the kids. You know how EC kids like repetition! When there is no straightforward storyline, we just chose something from the parasha that we thought would be meaningful to the children and that they would be able to apply to their own lives. Sometimes it was learning about Lashon hara (gossip), using the book Chrysanthemum by Kevin Henkes. We can have a meaningful discussion about how our words, or our tone of voice, can hurt people; this is just one example. JML: Are you working on any other books or new projects at the moment? 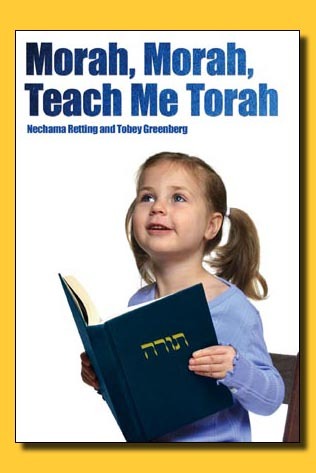 NR: We have other things we've written which are available on our website www.Torah4kids.com. We’re currently working on a Holiday Service Guide to use throughout the year. I teach Tot Shabbat each week, plus have led youth services for Rosh Hashanah, Yom Kippur, Sukkot, Pesach, and Shavuot. Plus, I write a free monthly newsletter for Shlock Rock that talks about Torah, Mitzvot, Middot, Israel and the Holidays. Anyone is welcome to join the newsletter list; just email me! JML: Tell me something homeschooling parents might not know about introducing very young kids to concepts in the Torah...! Thanks so much for your interest in our book!